Good Evening my devils and ghouls! Welcome to my holiday post. I hope you are all well and fantastic. I’m hoping to get a new lining for my coffin this holiday season. ‘Tis the season for people to act like spoiled brats and be greedy little bastards people! What a wonderful world we live in? I have seen a lot during my part-time job in retail. The way people threaten associates and even managers, put their hands on associates over coupons… it’s completely ridiculous. Anyway, no ranting today! Today we will talk about Santa Conquers the Martians! 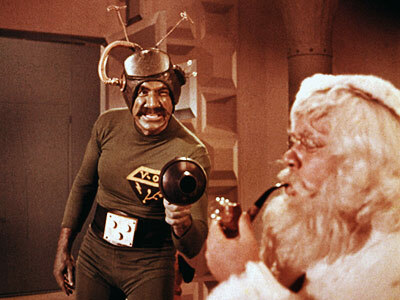 Santa Conquers the Martians is a B-Movie from 1964. I gotta say, it’s one of the funniest films I have in my library. The martians kidnap good ol’ saint nick so he could bring xmas joy to them. The reason why? because their martian children are obsessed with television from Earth. So they kidnap Santa and he goes on an adventure. I highly recommend this to anyone who needs a bit of goofy von toofy sort of film. Whatever that means… I don’t know.. it’s been a long and dreadful day… anyway, we follow Santa to his toy shop in Mars and watch these men in suits.. I mean Martians, get into horrible squabbles and bring you some joy at it’s idiocy!